If you’ve got itchy feet because you haven’t traveled in a while, or if you are homesick because you are still traveling – this is the best place to go! 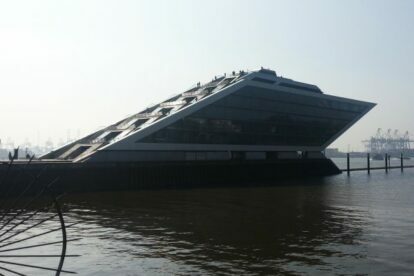 Dockland is a fantastic 25m high office building (by HadiTeherani) formed like a ship, situated in the middle of Hamburg’s harbour, with a great view from the top to the docks over all the incoming and outgoing ships. Take the HVV-ferry from Landungsbrücken to Dockland for a romantic harbour sunset. It always gives me the feeling I am at the gate of the world! No entrance fee, only a little work-out with all the 140 steps up to the platform. But after that little exercise I am always feeling like ‘Rocky’ on the top, – no matter if it is foggy or sunny, Monday or Saturday, in the morning or evening, it is always awesome! Ohhh, itchy feet!